When you are named the best buddy book on the stands by Ain't It Cool News, you've got to be worth a tribute or two. 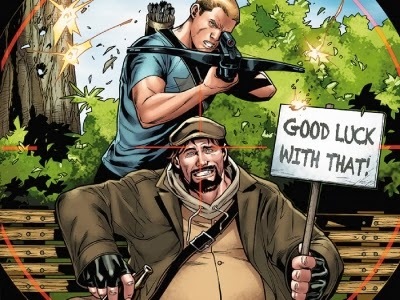 One fan of Valiant's relaunched Archer and Armstrong has a son that decided the best gift he could get his Dad, was a commision by painter The Left Handed Monkey of the humorous duo. That is an incredibly accurate painting. Not just in technique, but keeping the personalities of the subjects in line. I love it. It might just replace my Order of the Stick wallpaper. Thanks Random - I like the narration too, even down to Acclaim, this guy knows how to make painting entertaining.